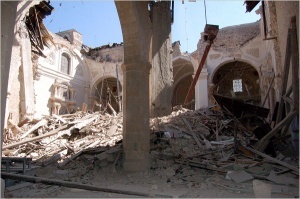 On April 6, 2009, a 6.3 magnitude earthquake occurred in the central Italian region of Abruzzo. The quake is the deadliest earthquake to strike Italy since 1980. L'Aquila, capital city of Abruzzo, and surrounding villages have sustained significant damages and losses. Almost 300 people are reported to have died in the quake. 28,000 people are currently living in refugee tent cities, many of whom may soon be homeless, as the earthquake has leveled scores of apartments and homes. The devastating loss of life and homes has greatly impacted the region of Abruzzo and extended to Italy and the global community. While nothing rivals the enormous loss of life, many citizens of L'Aquila have expressed their deep sadness over the devastation to their city and historical monuments. Standing among the rubble of buildings is the Santa Maria di Collemaggio, a historical church that was the site of the coronation of Pope Celestine V in 1294. The rear aspe of the Romanesque basilica is now collapsed. 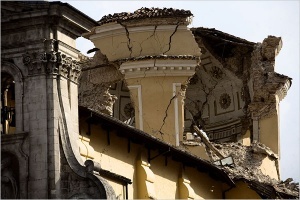 In L'Aquila alone, two other churches in the historic center have suffered severe damage, their cupolas cracked wide open. Photos from the region show the city hall and an orphanage crushed and in ruins. Porta Napoli, the cities oldest gate built in 1548 in honor of the Holy Roman Emperor Charles V, was reportedly destroyed in the quake. National Museum of Abruzzo, which is housed in the 16th-century castle, has collapsed and is currently too unstable to enter. Paganica, a town 6 miles away from L'Aquila, has reported damage to the Church of Santa Maria della Concezione and Santa Maria del Presepe. The Santa Maria del Presepe was once famous for its lovely rose windows, which now feature gaping holes. The damage of the quake also extends outside of the Abruzzo region. Officials in Rome said that the quake had also caused damage to the Baths of Caracalla, a Roman bathhouse built between AD 212 and 216. How will L’Aquila rebuild from this devastation? The most immediate and important need to is to continue recovery efforts in the areas affected by the quake. The International Federation of Red Cross is one of many organizations that has been contributing financially and with ground volunteers, and still welcomes financial donations from individuals. Housing and shelter will need to be found for the displaced citzens of L'Aquila. And, it is hoped that someday these historic monuments that define the identity of the region can be rebuilt, restored or salvaged in someway. Silviio Berlusconi, the prime minister of Italy has begun the process of soliciting foreign aid for the restoration of L'Aquila's historical monuments. Already more than 11,000 volunteers and rescue workers have rushed to help. Cultural heritage is not an easy term to define, but it is something that can define people, their region and their identity. It can signify history or home. When disasters such as the L'Aquila earthquake strike, we are reminded of its fragility and its importance in our lives. Where Culture Is Another Casualty. Kimmelman, Michael. The New York Times. Published 4-11-09. Damage to Historical Monuments ‘Significant.' Povoledo, Elisabetta. The New York Times. Published 4-6-09. 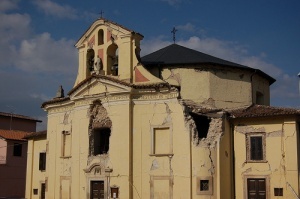 The church of Santa Maria del Suffragio suffered severe damaged in the earthquake. The dome is now destroyed. Photo by Samuele Pellecchia/Prospekt.